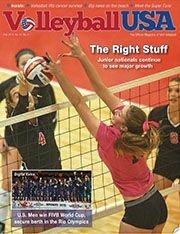 Girls Varsity Volleyball Coach Aly Dahl is featured in the Fall 2015 edition of Volleyball USA Magazine. In the article, "5 Keys to Anticipating What Will Happen Next," Coach Dahl discusses the importance of preparation, the benefits of using video as a teaching tool, and the advantages of analyzing players' habits. Dahl is the only high school coach featured in the story. U.S Women's National Team Technical Coordinator Joe Trinsey, University of Georgia Women's Head Coach Lizzy Stemke, Loyola Marymount University Head Beach Coach John Mayer, and professional beach volleyball player Heather Hughes also contributed to the article.